Update: Exciting news, everyone! The comic is due out on November 7 and we have our first full color look at the art (above). Head to Comixology to pre-order it or check out the art in its full-size glory, because this cropped version just doesn’t do it justice. Every time I think there’s no chance of any new Diablo games being announced, Blizzard goes and does something that has me thinking it might be happening after all. According to this article at Bleeding Cool, not only has Blizzard teamed up with Titan Comics to put out a Diablo comic, they’ve gotten Marv “I wrote Crisis on Infinite Earths and made the version of the Teen Titans with Starfire, Cyborg and Raven on it” Wolfman to write it. The comic will have art by Piotr Kowalski, who’s done adaptations of The Witcher and Wolfenstein as well as a Hulk comic. 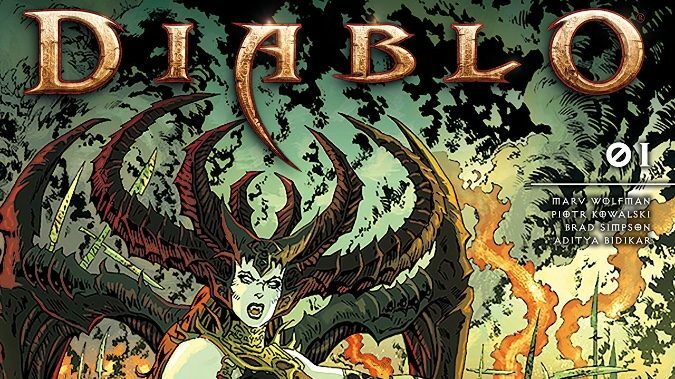 The comic, simply called Diablo according to the press release, concerns a group of scholars and crusaders delving into the secret origin of humanity. They discover a shocking revelation that threatens their faith. Since we know what that revelation is — that all humans on Sanctuary are half Angel and half Demon — it’ll be interesting to see how the comic series deals with that story. Titan Comics specializes in a diverse spread of titles, including quite a few licensed ones like Robotech, Doctor Who and Penny Dreadful, so it feels like they could be a good fit for Blizzard and Diablo. It’s been quite a few years since Reaper of Souls came out — four of them to be exact — so it’s possible this is a simple tie-in. But we’ve talked in the past about Blizzard and their possible unannounced Diablo game. Seeing a name like Marv Wolfman’s attached to a Diablo miniseries definitely has me thinking that Blizzard may well be announcing a new Diablo title soon as well. I really think this feels like a step towards Blizzard announcing a new Diablo game. Moves like this just feel like they’d have more going on that Blizzard saying Oh, hey, we have a Diablo setting, let’s get a comic out to me. But we’ll find out soon, as Gamescom is next month and BlizzCon is in November. If Blizzard is going to make any kind of major Diablo announcements, it’s likely we’d hear them at either convention.